Abandon the solid colors for a cool Hawaiian print on your next swim shirt. 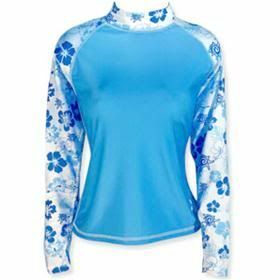 Not only stylish, but with 50+ UPF protection, the Sarah Long-Sleeve Rash Guard by UV Skinz is also the healthy choice for your skin. Even if you don’t, everyone will think you’re a surfer chick as you walk down the beach enjoying that shaved ice wearing this top over your bikini.